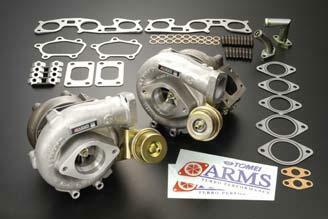 Tomei Turbocharger – ARMS Kit are the best bolt-on turbo kit money can buy. These turbines provide the perfect balance of great power through the RPM band without compromises to low & mid range speed. Amazing torque, power & response. In the development of ARMS, we took an arrangement for various related things, such as enough quantity of fuel for the turbine, the best camshaft matching, and compression ratio with REYTEC and Tomei-ECU. These are the practical data that had been extracted and stored not only on the bench but also at every day driving, circuit time attack, and at the drift convention, and were analyzed by data logger. In the Tomei ARMS series, every single parts required for assembly including gasket are in the kit for convenience.